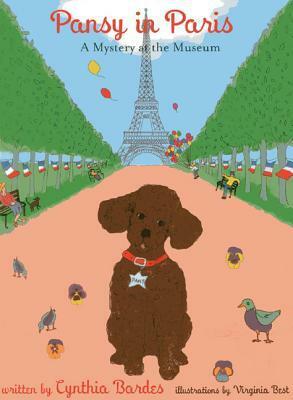 Pansy in Paris: A Mystery in the Museum by Cynthia Bardes, illustrated by Virginia Best, is the second book in which Pansy, a toy poodle, solves mysteries. Pansy and Avery (the little girl who owns her) are high class with moral sensibilities about right and wrong. When an inspector from Paris calls on Pansy to solve another museum mystery, Avery and Pansy have little choice but to get Avery’s mother to agree to a trip to Paris. The illustrations are bright and resemble paintings, which is a testament to Best’s background as a painter. The illustrations look like water color paintings, and go perfectly with the charming story of Pansy and her owner. Pansy and Avery even have the time to take in the sights in Paris, while solving the mystery. My daughter loves dogs, and we have a shelter dog of our own. Pansy is intelligent and quick-witted. My daughter loves animals and it was great seeing her react to the pictures and listening to the story. There is conflict, an adorable dog, and tourist sights in the book, but there’s also a museum full of doggie portraits and famous doggie artists. Pansy in Paris: A Mystery in the Museum by Cynthia Bardes, illustrated by Virginia Best, is adorable and fun, but there’s a little too much text for my little reader, but it does make a good book to read together. Cynthia Bardes and her husband, David, spend each fall at a Beverly Hills hotel with their toy poodle, Pansy. Inspiration for this story was born out of random misfortune. One day, when crossing Wilshire Blvd., Cynthia was struck by a car. Her injuries required surgery and a lengthy recuperation at the hotel. While bedridden, Cynthia’s vivid imagination and Pansy’s popularity with employees and guests of the hotel made for a perfect story. A graduate of Sarah Lawrence College, Cynthia is a former dress designer and interior decorator. When not in Los Angeles, Cynthia and her husband live with Pansy in Vero Beach, Florida. 25th book for 2014 New Author Challenge. It does look like a book Wiggles would enjoy. So cute! It was very cute, and this is the second book in the series. I’ll have to find her the first one. I thought it was cute, and the little girl loved the doggie.